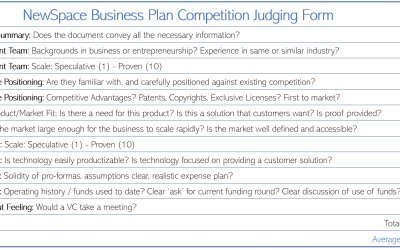 On November 9, 2018, the Center for Space Commerce and Finance (CSCF) announced Sugarhouse Aerospace as the winner of the NewSpace Business Plan Competition (NSBPC) that took place as a part of the New Worlds Conference in Austin, TX. Sugarhouse Aerospace has created a business model that focuses on the niche market of suborbital launches with the hopes of dramatically lowering the cost associated with accessing space to just $1,000 a customer by fitting 100 customer payloads on one launch vehicle. The grand prize of $2,500 was presented by Austin Dula on behalf of the Heinlein Prize Trust. 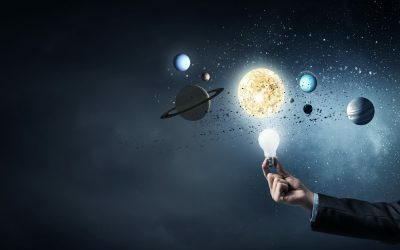 The panel of five judges had a difficult decision to make with other competitors like Slooh, an online service that makes it easier for people to be astronomers, and Froberg Aerospace, which has a developed a propulsion system that can use both electric and chemical propellants in the same system. Ultimately, it was Sugarhouse’s low cost niche market focus that stood out in a field of tough NSBPC competition, but also as a strong business model for an increasingly crowded launch industry. Additionally, there was also an audience choice award which was awarded to Slooh. CEO Michael Paolucci told us about Slooh’s mission to make looking at the stars easier than ever by creating an simple user interface that lets customers connect to and control some of the most powerful telescopes on the planet. Slooh believes that by getting more people to look up at the stars, it will be able to inspire the next wave of dreamers who will help get us there. The judges for this competition included Austin Dula, Legal Advisor to Heinlein Trust; Karen Cruden, Project Management Leader at SSL; Gavin Gillas, General Partner at SpaceFund; Stephan Reckie, Founding Management Member of Angelus Funding and organizer with SpaceCom; and Dustin Boyer, Commercialization Manager at DARPA. The Center for Space Commerce and Finance (CSCF) is a Texas-based, 501(c)3 educational non-profit organization focused catalyzing the growth of the NewSpace economy. CSCF develops educational programs, events, and publications focused on connecting and educating entrepreneurs and investors, with the goal of increasing investment deal flow in the commercial space industry. Our founders and team have been spearheading the development of the space economy for the last 30 years, including building, developing, and investing in space businesses. CSCF is built on this wealth of experience, with the goal of providing the industry’s most definitive resource for both entrepreneurs and investors. The flagship project of CSCF is the NewSpace Business Plan Competition. Over 200 companies have participated in this educational program to date, gaining real-world fundraising experience and practical advice on how to improve their business models. Since 2006, the competition has awarded over $350,000 in prizes to promising startups. Along the way, more than 60 companies were publicly showcased to investors and customers, catalyzing millions in deal flow. New Worlds Conference and New Worlds Institute are part of the EarthLight Foundation, an international 501(c)3 charitable education and research organization registered with the IRS and the Texas Secretary of State. EarthLight and its affiliates and DBAs do not participate in lobbying or any political or direct advocacy or other policy activities. Their mission is to catalyze, facilitate, enable, and help lead the human settlement of space. What Makes a Good Executive Summary? Whether you’re preparing your entry for the NewSpace Business Plan Competition, or getting an executive summary ready for investors, it’s important to understand what your audience is looking for so you can provide the right information, in the right format.